I recently tried out Unroll.me, a service that taps into your email account and lists what newsletters you are subscribed to. It provides you with a single, user-friendly interface to unsubscribe from unwanted emails. It surprised me to learn that I had subscribed to more than 2000 newsletters and set about clicking hundreds of times to clean up my inbox. It got me thinking about newsletters and how, from a business perspective, email is by far the most efficient channel to communicate with your audience. Campaign Monitor reports that in 2016 every $1 spent in email marketing results in a $44 return on investment (ROI). That means it has a 174% higher conversion rate than social media! 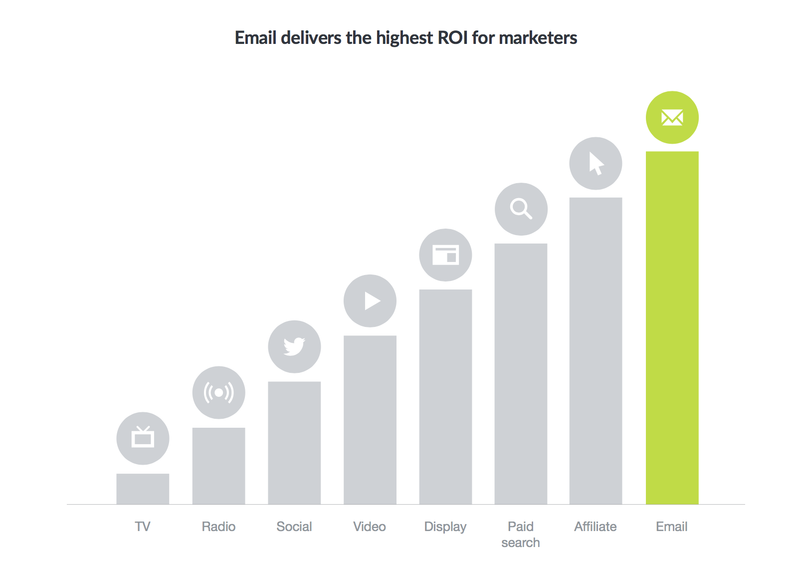 We do know that paying special attention to UX provides a far higher ROI than email, but the numbers are still pretty astounding. What makes that graph interesting is the fact that the cheapest option often delivers the highest ROI. Low investments can deliver great results. The biggest benefit is the fact that the sender owns the list. Everyone they’re sending email to has said (or we hope they have!) they are interested in the brand. Using this formula, investment in TV advertising confuses me. Think about a brand like Whiskas (who produces cat food) as they have historically poured money into TV advertising. Their goal is to talk to current or potential cat owners – let’s estimate that as 5-10% of those watching – but they are spending money on the other 90-95% that have little to no interest in their product. No wonder the ROI is awful. With our mobile devices always at hand, why not invest more into instant, personalized communications like email to make sure we’re always accessible for that last minute deal? Is your newsletter providing value? The other thing I realised during my unsubscribe marathon was the majority of those newsletters were really bad. Perhaps the low cost of sending makes us less mindful in crafting a quality message as opposed to investing millions into that one, “perfect” TV commercial. With email we know (or at least we should know) who our recipient is and what they enjoy. Little things like just saying ‘Hey Anton’ rather than ‘Hey’ provides a personalised experience for the reader. To go even deeper, if we can customize emails based on what was previously purchased/looked at, it becomes more memorable and leads to higher conversion. It’s unlikely that everyone on your list is the primary target for your new campaign. The more you know about your list, the better you can segment your campaigns to send the recipient only what they really want to see. Almost all email software does this today including Mailchimp, Drip and Convertkit. A segmented campaign can drive a 760% increase in revenue compared to a one-size-fits-all one. You can invest time crafting the perfect subject and content, personalize for your audience, and segment your list, but there’s always stuff that can be improved. The benefits of email marketing is that not everyone needs to get the same thing. Every audience is different. You must test to know what works. A/B tests can improve conversion rates by 49%. While Paul Jarvis sends his Sunday Dispatches every Sunday like clockwork, I realised that sending one email every other week isn’t always possible for me. My client work always comes first and when things are hectic, I won’t always have time to craft a quality blog post and the newsletter to accompany it. So I’ve dropped the idea of always sending a newsletter every other week. While I’ve just sent two newsletter just a week apart, I’m guessing that come December, they’ll begin to be less frequent. At this point in my life, that is what is going to work best for me so that I can continue to provide inspired content in the future. Quality over quantity!